Michael loves to hang out with me in the kitchen, even plays with his play kitchen while I'm cooking. He always wants to help, but I didn't have any kid friendly kitchen utensils that he could use. I happened to run across a company that specializes in just what I was looking for, Curious Chef. I put the foundation kit on Michael's wish list and my step-mom ended up getting it for him for a birthday gift. We've used some items out of it, but have never baked/cooked anything with the set. While Mom was in for Thanksgiving, we made pumpkin pies and Michael was happy to help out. This was actually taken back in June. The kit came with oven mits, a chef hat, and an apron. Michael doesn't like to wear the hat that much, but loves to put his apron on and use his oven mits when he can. Don't forget to wash your hands before making food. We went the easy way and bought the pre-made pie crust, but Michael wanted to roll out the dough with his roller. We started out by getting all the measuring cups and spoons out that we needed. They are great for kids. Easy for them to hold, even with the ingredients in them. 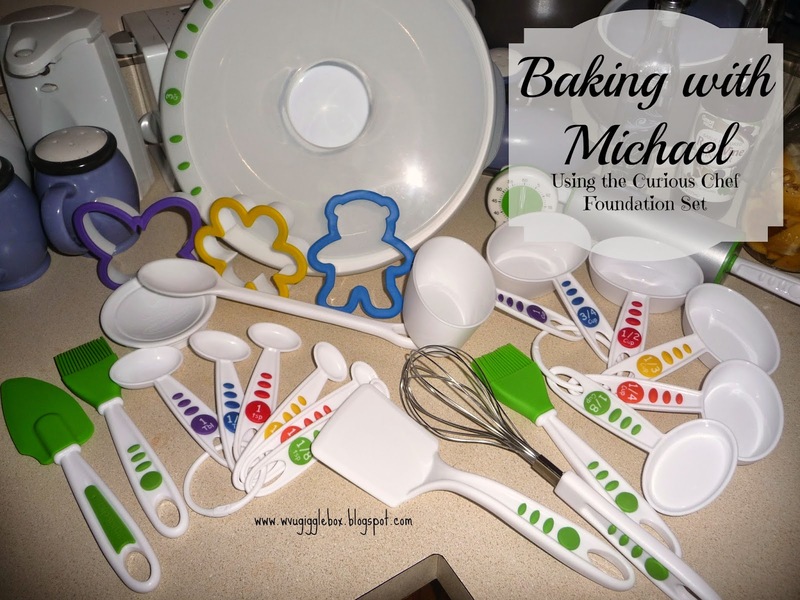 Each cup or spoon have different colors on them so for those kids who can't read, like Michael, you can just tell them what color you're looking for. One downside to the spoons are that they are on the wide side so you can't easily put them in small containers. The kit only came with one mixing bowl (3 quart) so, we didn't have a smaller kid friendly mixing bowl to mix the dry spices in. They do have smaller mixing bowls (2 quart and 1 quart) that you can buy. Using the 3 quart mixing bowl. It was just the right size for mixing the pumpkin mix. All the items are made of heavy duty plastic and I love that they're dishwasher safe. He had so much fun making the pumpkin pies. Don't forget to set your timer once the pies are in the oven. 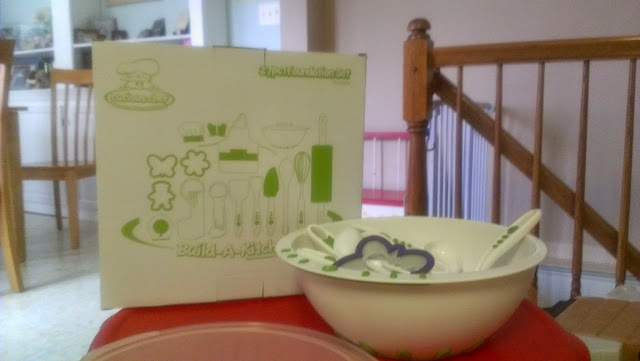 I highly recommend this kit to anyone who has a little one that loves to help out in the kitchen. Curious Chef has several different sets or you can buy piece by piece. I have several of the other items on Michael's wish list. If you have more than one child, I'd recommend buying the kit and then you can buy an additional apron, chef hat, and oven mits so both have their own, but can share the kitchen utensils. I've been putting all the items from the kit back in the box it came in. I think this tool caddy would be so helpful. All Michael's kitchen tools would be in the caddy and sitting on the kitchen counter. They truly have thought of everything! 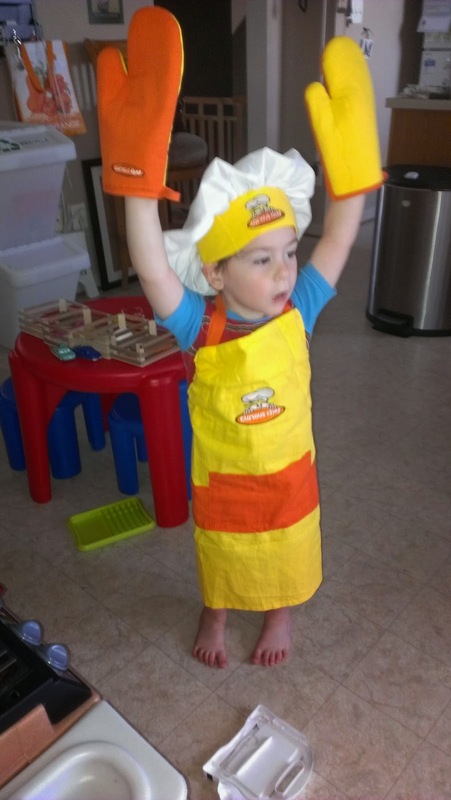 Have you used any Curious Chef products with your little chefs? Have little chef in your house that needs their own set of kitchen utensils?